Antonio… freshly published on Amazon! Thanks so much for your patience while I’ve taken a break from my blog to complete work on my just-published books (more info on them below)! I’ll resume posting on Sunday, July 26 with the first in a series from my recent 21-day trip to China. 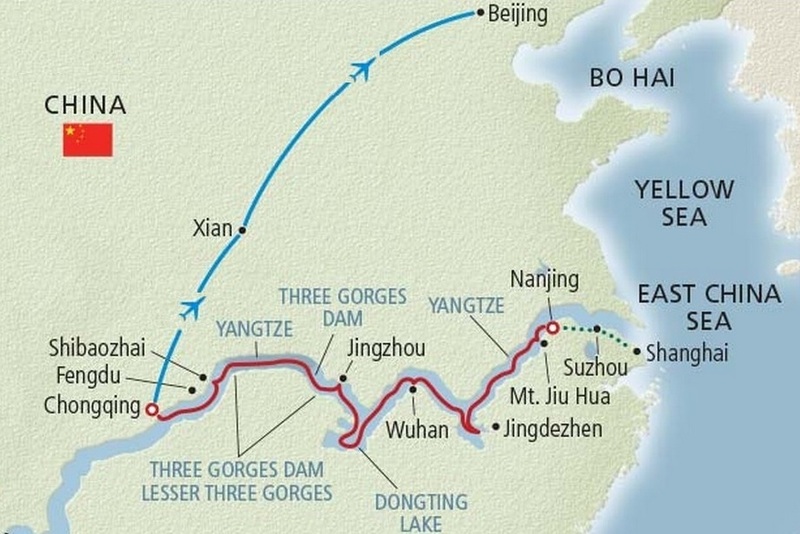 The China trip begins with a long weekend in booming Shanghai, continues for 12 days along the Yangtze River and wraps up in Xi’an (home of the ‘Terra Cotta Warriors‘), and Beijing. 21 Days In China is a chance to look beyond current headlines for firsthand insight into the culture, history, cuisine, and faces of today’s China! Two of my books previously first released only as digital editions are now available for the first time in paperback on Amazon! 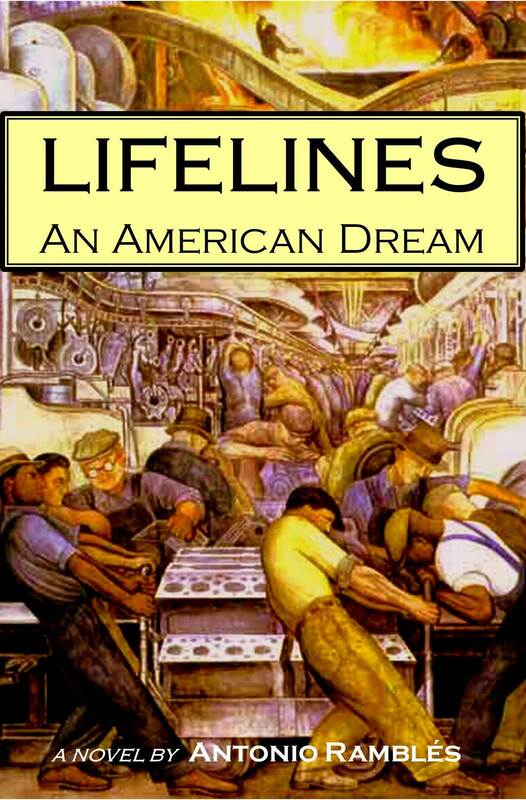 LIFELINES: AN AMERICAN DREAM (2014). My second book and first novel is the story of two families who abandon their pasts to pursue the American dream, and whose lives intersect in the melting pot of the industrial Midwest. This is a collection of intimate snapshots that brings to life a history fast fading from collective memory. Rich in historical detail, it is set against the backdrop of America’s emergence as a world power in the twentieth century, and the rise and fall of organized labor. Find it in Paperback or for Kindle and other e-readers here on Amazon. LAGUNA TALES (2011). My first book, a collection of short stories, draws on my own experiences to capture the lifestyle of the expat community in and around a mountain village in Mexico. 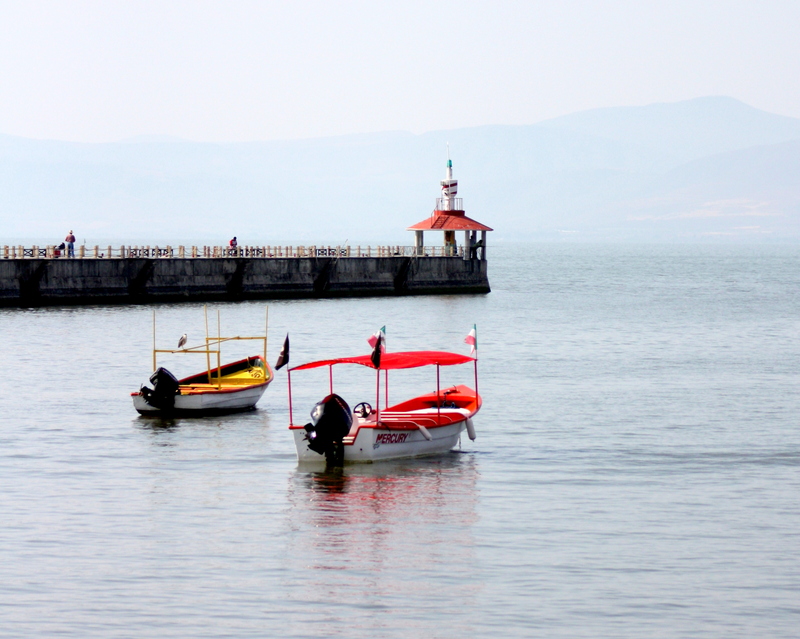 Six Americans from different walks of life arrive at personal crossroads that separately lead them to begin new lives along the shores of Mexico’s Lake Chapala. Find it in Paperback or for Kindle and other e-readers here on Amazon. EMBRACING THE FOG (2015). 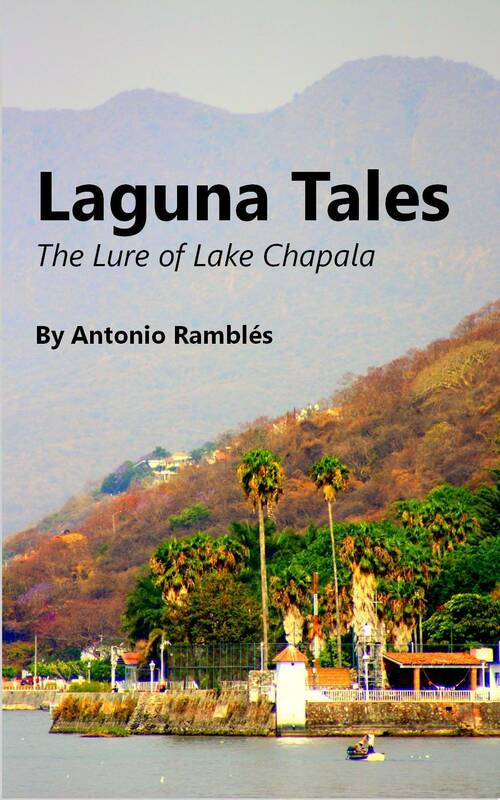 I’ve partnered with three American writers from the Lake Chapala area on this new short story collection, which includes five of my previously-unpublished pieces. These eighteen short stories are studies characters at life’s crossroads in settings that span four continents and more than a century. They run a gamut of styles from sobering to whimsical, and from stark realism to the fanciful. Find it in Paperback or for Kindle and other e-readers here on Amazon. MEXICO: SUNLIGHT & SHADOWS (2015). 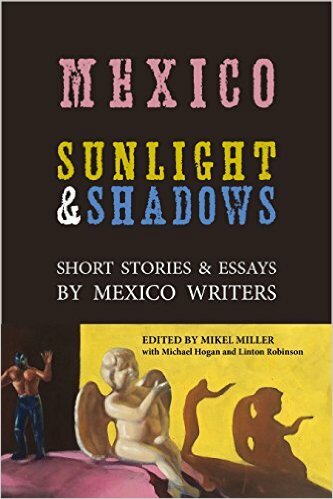 I’m honored by the invitation to contribute one of my pieces to this just-published collection of short stories and essays by some of the most widely read English language writers in Mexico. 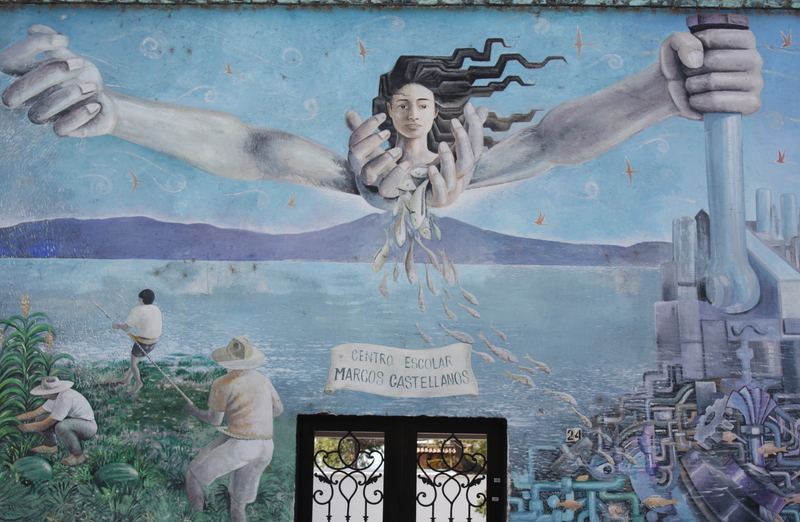 This anthology captures the work of twenty-two published authors who write and live in Mexico full time, and who share a view of life there as seen through their eyes. Find it for Kindle and other e-readers ONLY here on Amazon. THE MIRASOL REDEMPTION (coming soon). Watch for the August, 2015 release of my second novel, in digital and paperback editions on Amazon. 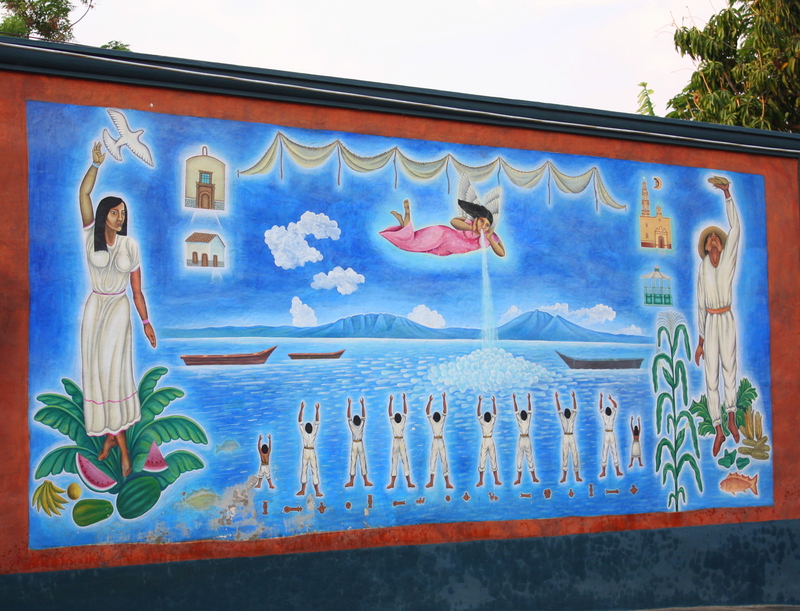 Mexican art is blessed by the rich muralist tradition of Rivera, Orozco, and Siqueiros, and even today murals remain a prominent feature of Mexican public art. 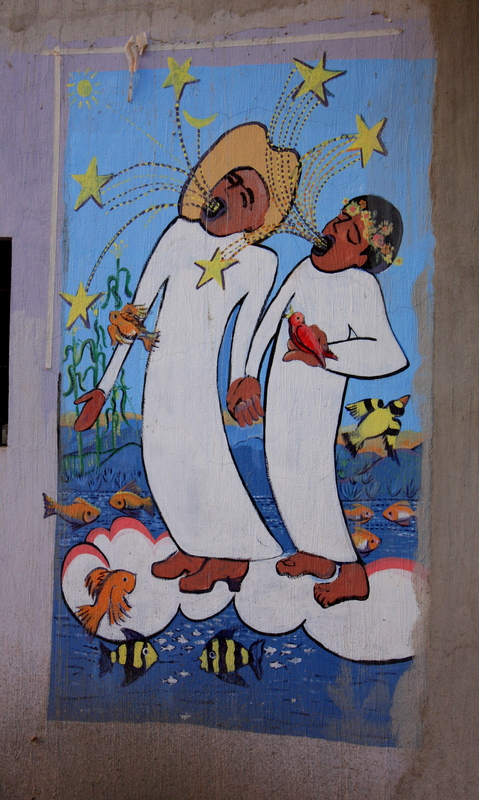 Murals are so commonplace in Ajijic as to be taken for granted, but they’re as much a signature part of the village’s character as spring blossoms or street vendors or views from the malecon. It’s hard for anyone on the Ribera not to pass at least one daily, and each image indelibly anchors the memory of everything that happens beneath it to a single spot. 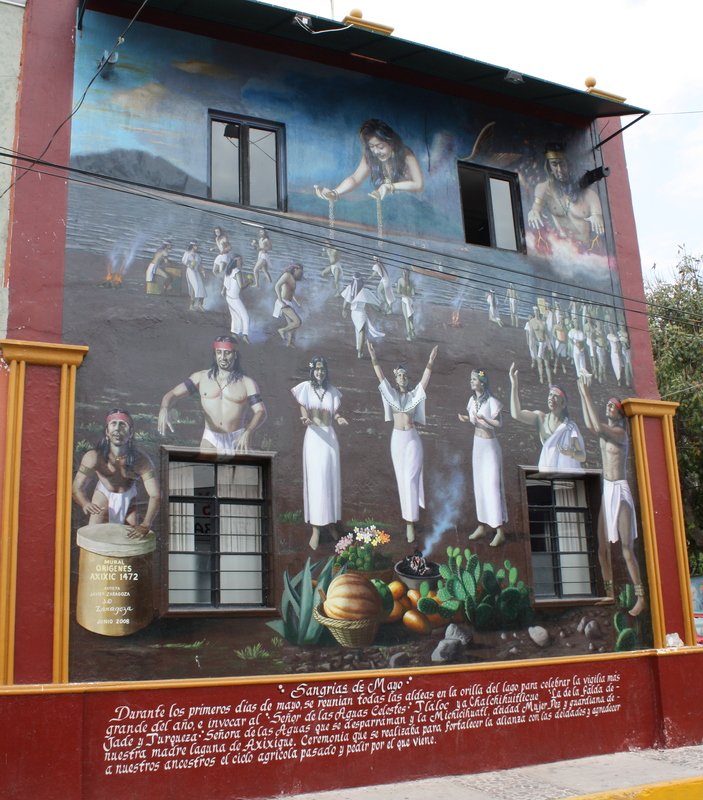 Murals made perfect sense as a way to present ideas and to perpetuate sense of history throughout Mexico’s illiterate past, but the art form is as fresh today as ever. 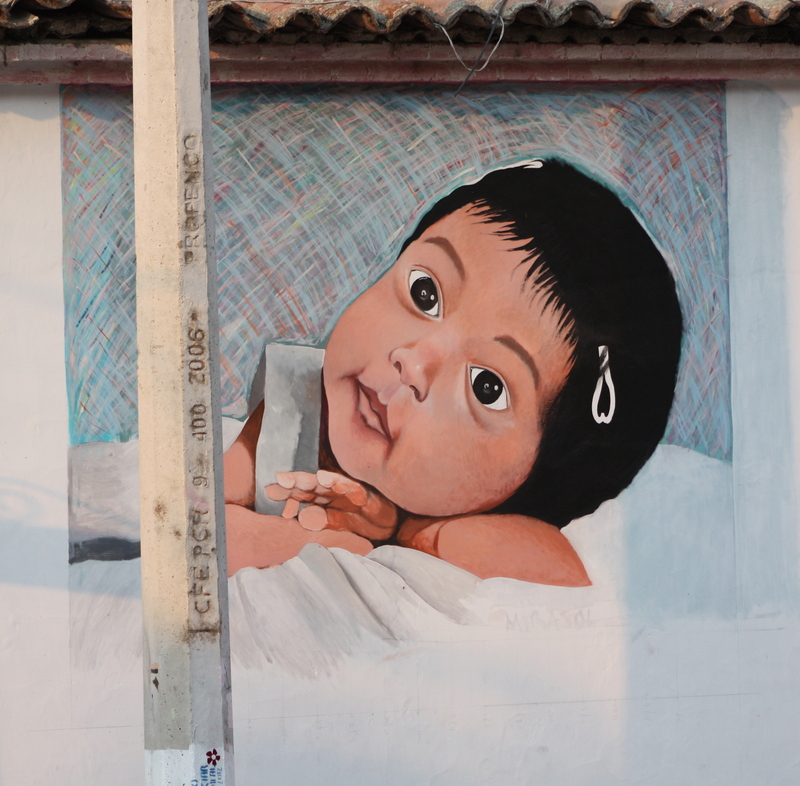 As similar as some murals may seem at first glance, their form is far from formulaic. 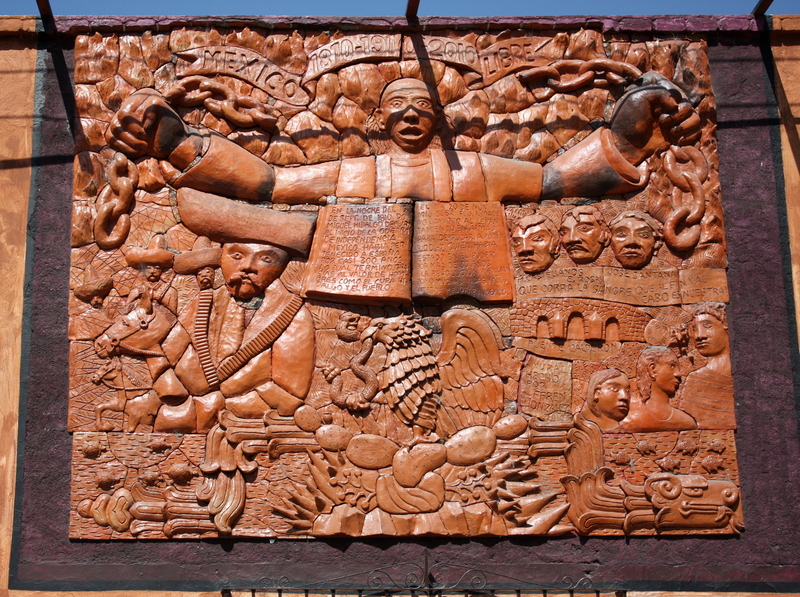 The topics may be patriotic or otherwise political, and they’re often historical. Sometimes, though, the primary object seems to be only to create pleasant diversion for the eyes and to adorn an otherwise unmemorable spot. Their forms are remarkably diverse, ranging from dayglo-bright ribbons to simple black-and-white images. 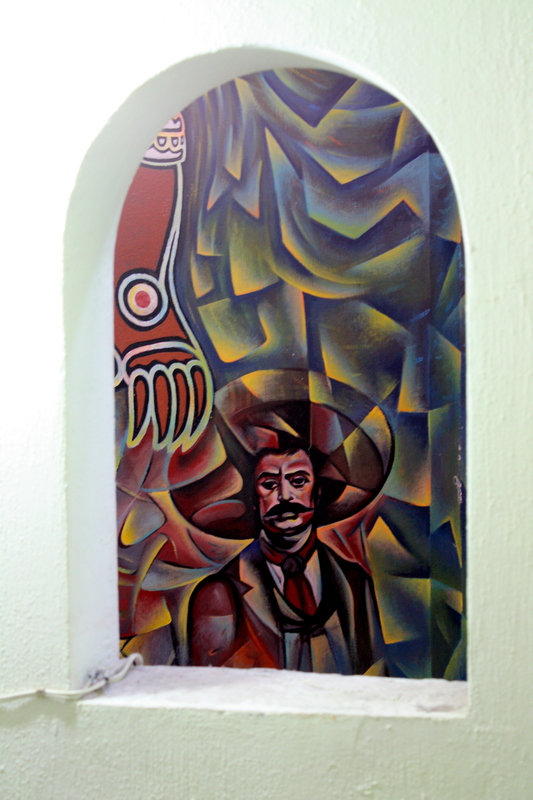 Some borrow their style from Europe and others are purely indigenous. 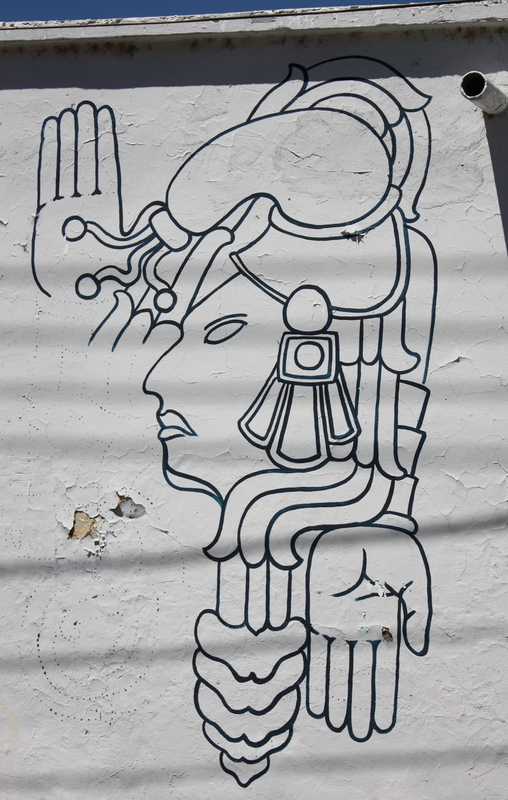 Some are painted and some in relief. Some have a commercial agenda. Many – but not all – are outdoors. 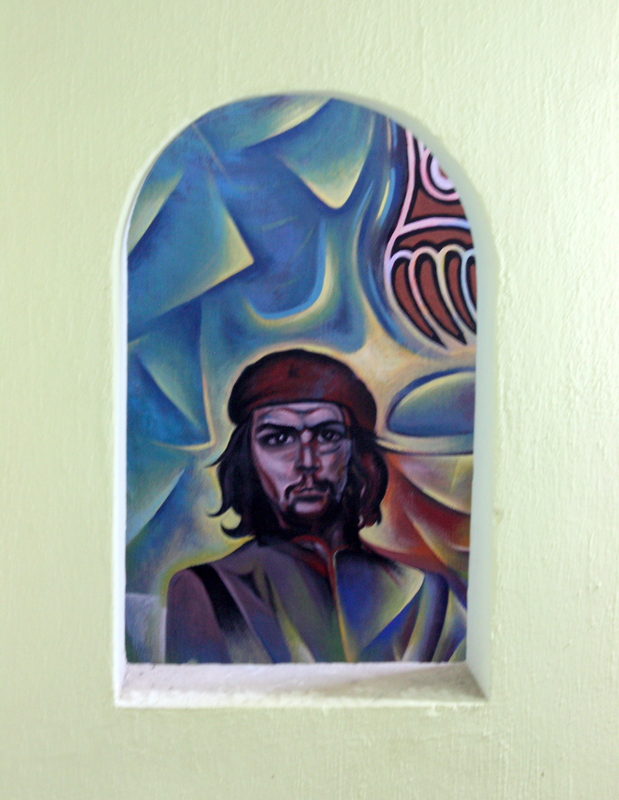 The one below adorns the interior stairwell of the Cultural Center. They all, however, have a couple of things in common. One is that each is an original work of art. 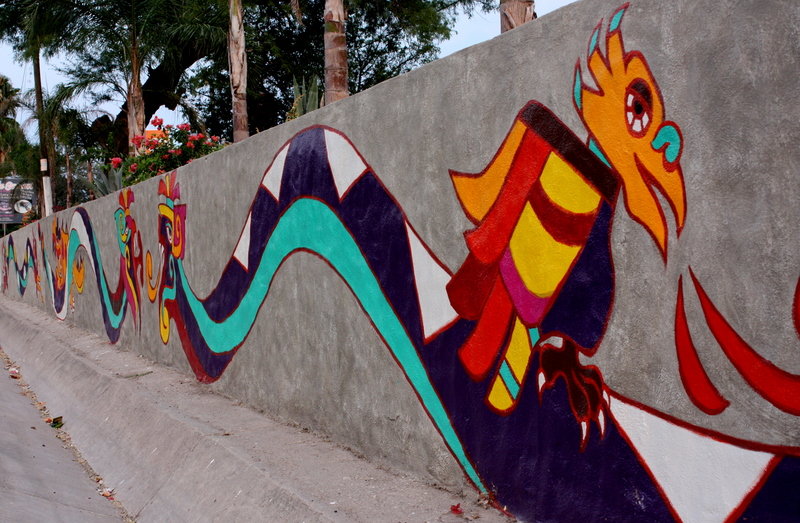 Some are permanent – or at least as permanent as paint on stucco can be in the Mexican sun – and others only long-lived enough to commemorate a passing event. Another is that they all tell stories. Some are short and simple. 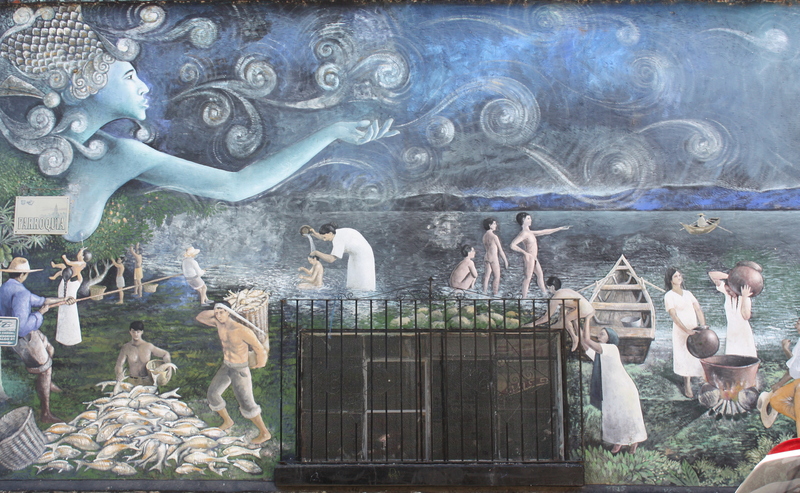 Others are like scrolls unrolled, so panoramic that each new look uncovers some detail earlier unseen, like the three panels of the mural below reading left to right. There was a time when billboard painting was an art north of the border. These days billboards are created in Photoshop, digitally printed by the dozens onto vinyl, and stretched over the frames of boards that were once signpainters’ canvasses. Something about the sight of a distant horizon anchored by an expanse of blue water makes a walk along the shoreline like no other walk. For most folks such a view is the stuff of which vacation memories are made. 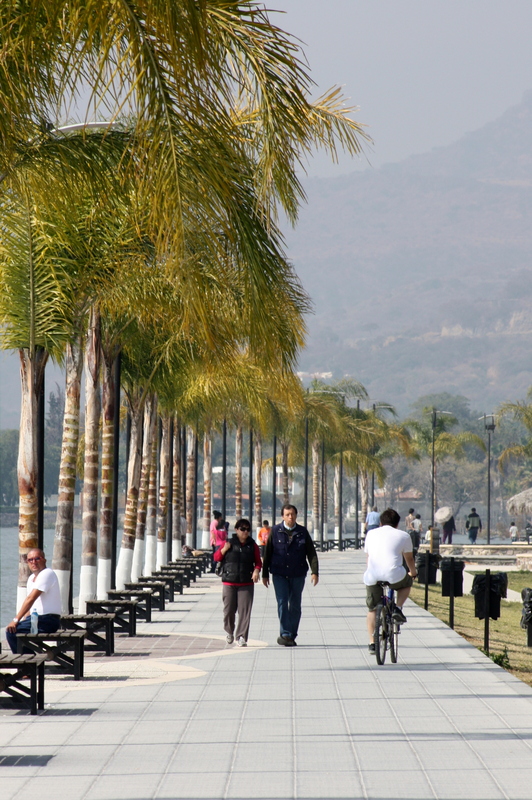 For anyone living along Lake Chapala’s northwest shore it’s an everyday sight from the ever-expanding public vantage point of walkways along its piers and seawalls… its malecons. 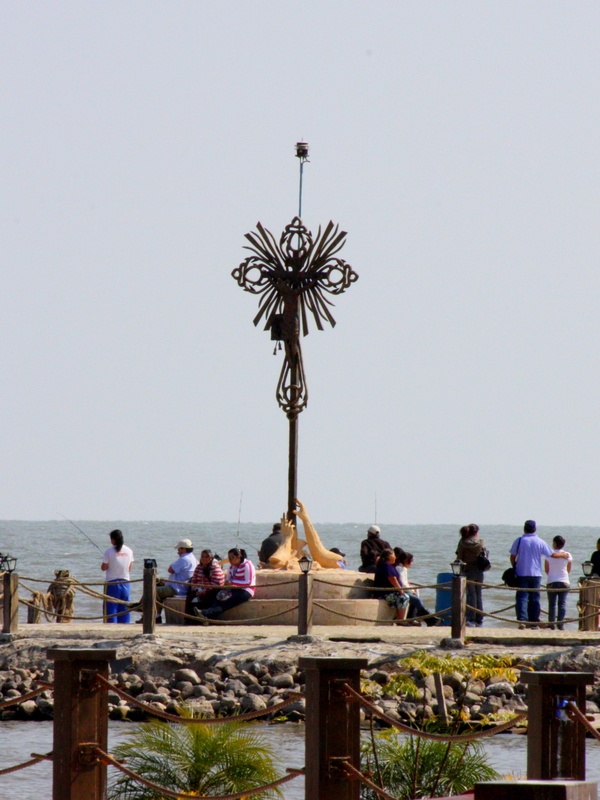 The malecon is a fixture of coastal cities in the Spanish-speaking world and in towns that grew up around them malecons are invariably community focal points. In these towns the malecons often feel as if the perimeter of a plaza square has been unraveled to form a thread along the water’s edge, and the waterfront is an organic part of the city. 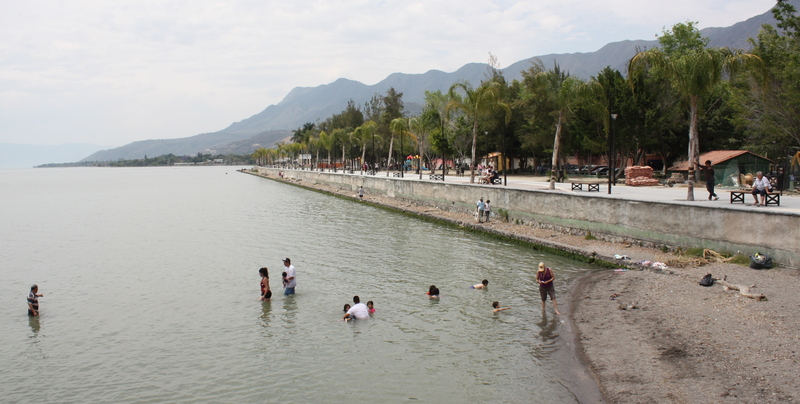 The construction in recent years of malecons along Lake Chapala in San Antonio Tlayacapan, Ajijic, San Juan Cosala, and Jocotopec (and the renovation of the one in Chapala) has created miles of lakeshore promenades that reinforce the historic connection between the lake and these one-time fishing villages. There’s more at work here, though, than history reaffirmed. These malecons liberate walkers from traffic lights and street intersections; there’s just blue water on one side and a city sunning itself on the other. 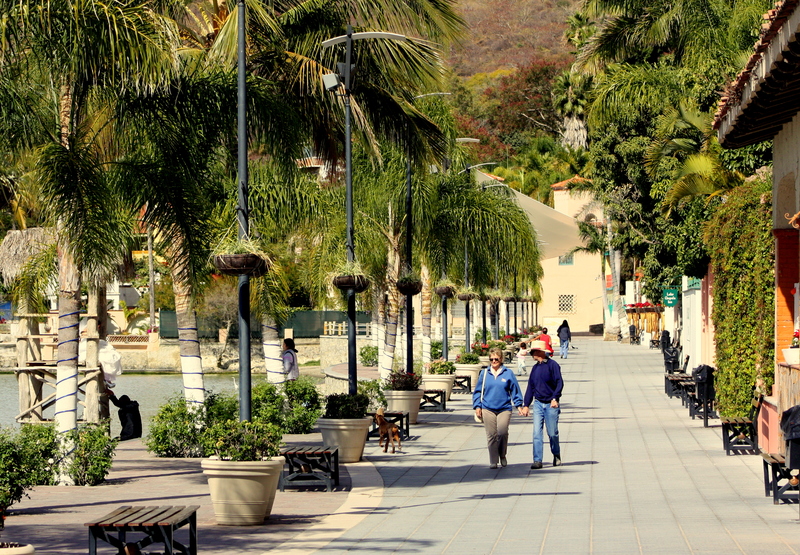 It’s a perspective that makes malecon-walkers in the city, but not of the city. 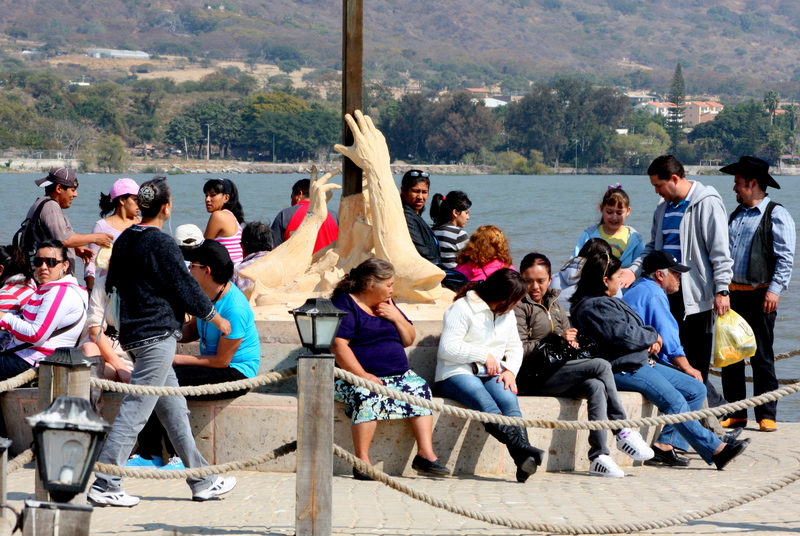 On each malecon the cast of characters may vary little from one day to the next, but the foot traffic has its own seasons and ever-changing images of lake, city, sky, and mountains creates a kaleidoscope of endlessly unique tableaus. Malecons deliver a great slice of local life. 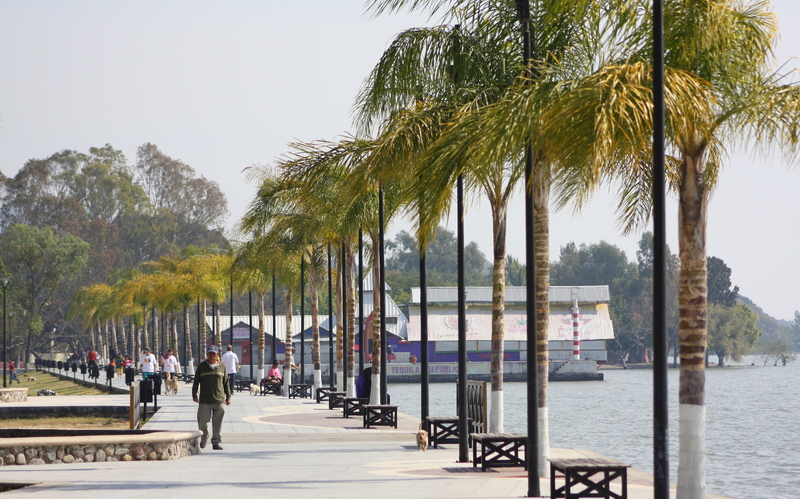 Depending upon time of day and day of week those along Lake Chapala are inhabited by a mix of everyone from local working men and women to frugal pensioners, well-off expats, and Tapatios. The dog walkers, speed walkers, joggers, runners, bench-sitters and kibitzers are weekday morning fixtures. 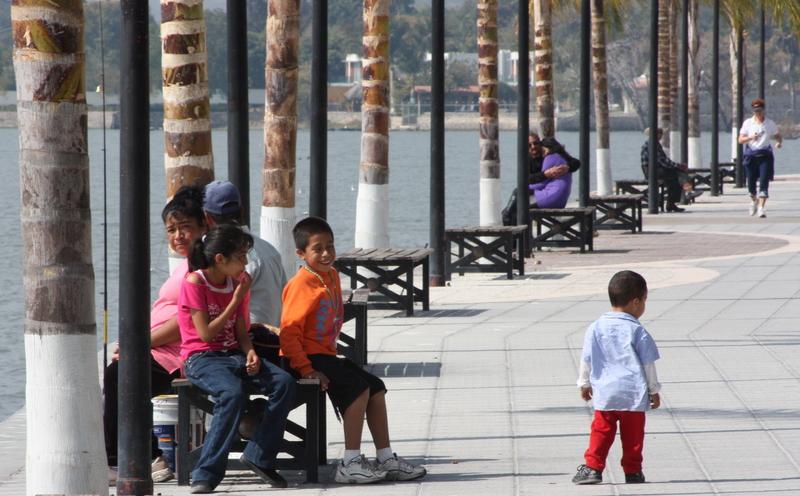 So are workday commuters on bicycle and on foot and children on their way to or from school; the malecon is also a sort of pedestrian libramiento. 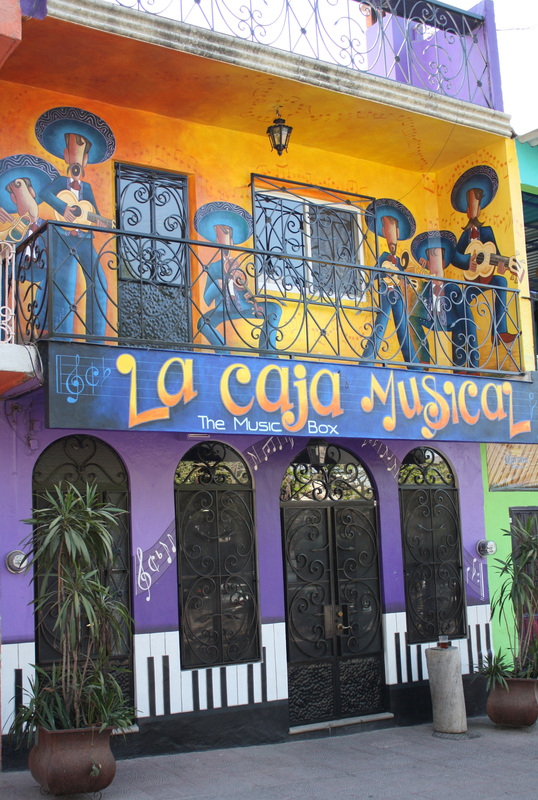 The malecon takes on a new identity when the mix of local families and Tapatios dials itself up on weekends and holidays. 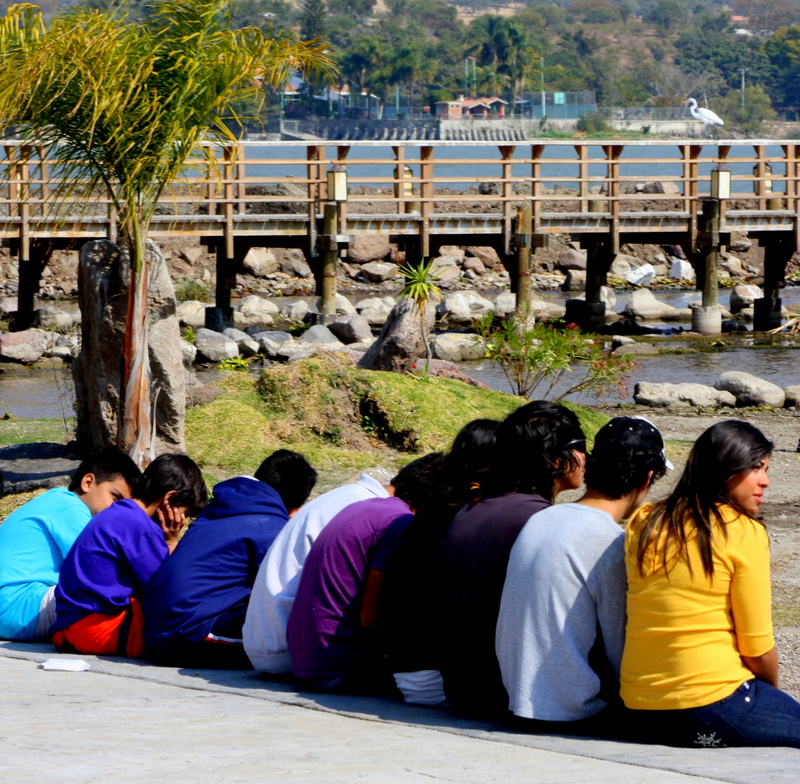 Mexico is a place where the generations still mingle, and the malecon is a prime venue at which to see and be seen. 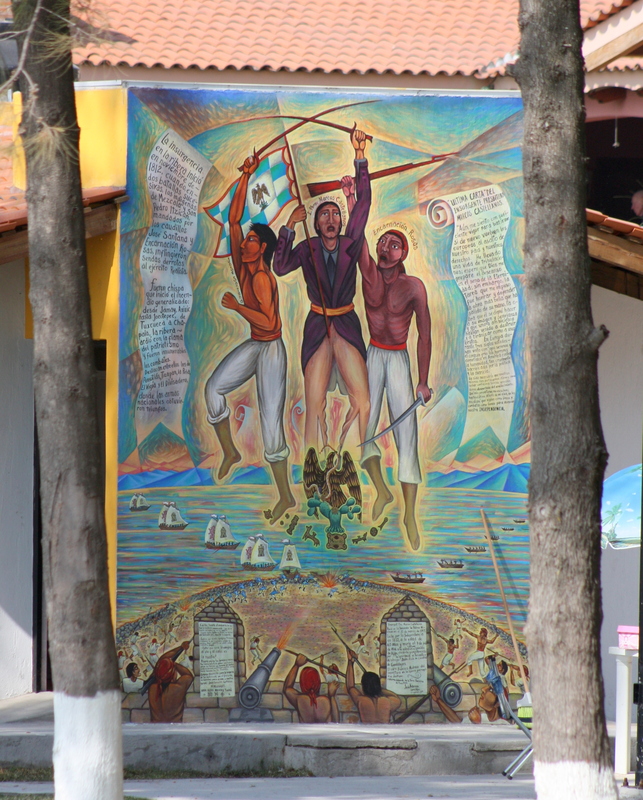 If you want to see a town unfurled for easy viewing, join the Sunday evening promenade on its malecon. The view of the water is not just about postcard-perfect sunrises and sunsets or about the people-watching. 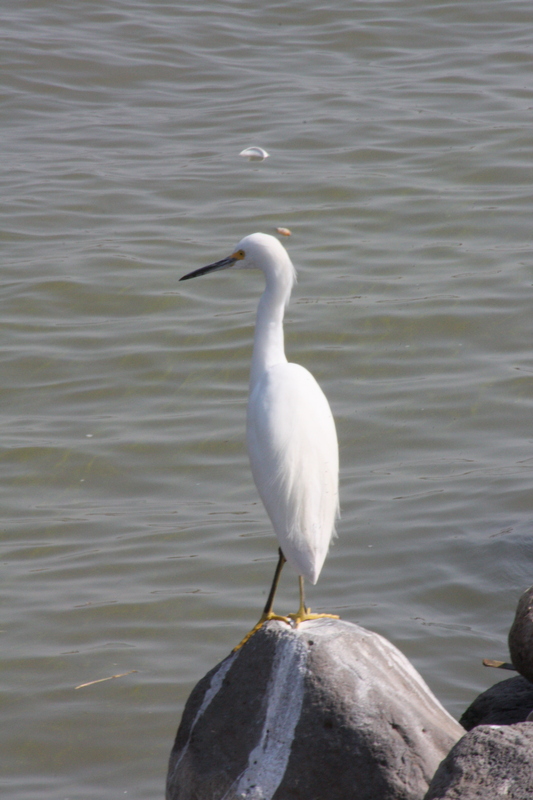 It’s about fishing boats leaving or returning and alabaster egrets at rest or in flight. It’s about lake currents streaking the water like swirling coffee cream, and the play of the sunlight through the clouds to make shadow puppets against the mountains on the far side. 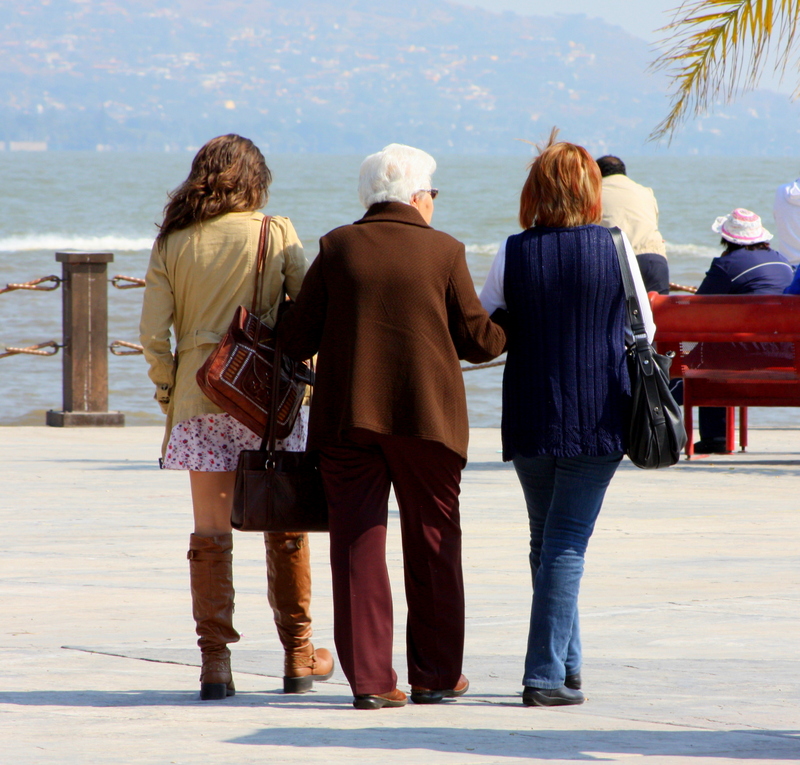 Perhaps most importantly, the malecon makes its walkers more alike for the duration of their shared experience than they are different in so many other ways.